If (and likely when) these Stadium Series games continue past the 2013-14 season, I can only wonder what the legacy of the jerseys will be. My thoughts on the 2014 crop of sweaters all seem to be the same. Decent ideas that were ruined by Reebok's and the NHL's insistence on shoving their new "technologies" down our throats. ...they have again been angled. These angled stripes and TV numbers are really dragging these Stadium Series jerseys down, in my opinion. As I mentioned above, the reverse lace-up style is ridiculous. The chrome wordmark and how it's applied to the jersey looks silly and cheap. The blue panels running up the side of the torso seem pointless. I haven't seen that design work...ever. Why should it be any different outdoors? It seems as if Chicago tried to fight the Reebok/NHL jersey technologies as best as they could. The result is that the idea of what the Hawks wanted to wear shows through. 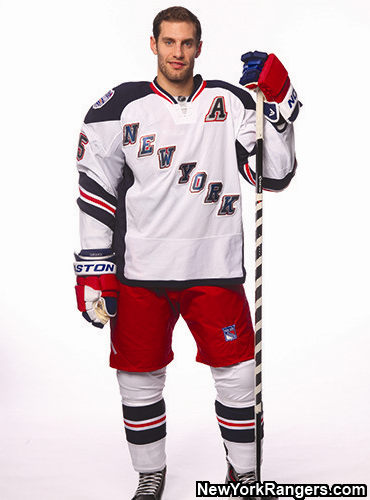 This tries to be a nice classy hockey jersey, but it seems to have been "George Lucased". That's where you take something that is done very well and you add technology to it because you can, not because it's the right thing to do. The elongated player numbers on the back don't look so bad on this jersey. The arm stripes have been butchered! They're cut off and angled. Of course, the TV numbers are angled. The hem cut on the other Stadium Series jerseys have been in the Pros section, for the most part. 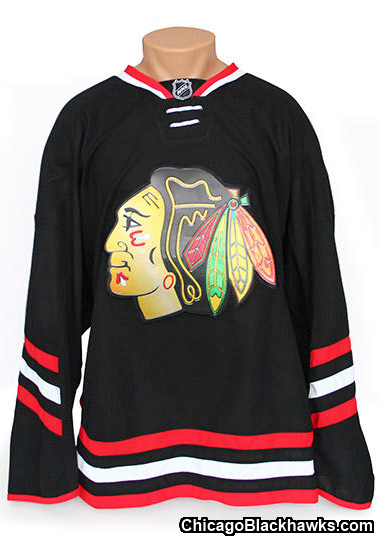 On the Hawks jersey the angled hem cut helps destroy what could have been great. The chrome logo looks gimmicky, silly, and cheap. This is a recording. Above you'll see a graphic supplied by the Blackhawks. 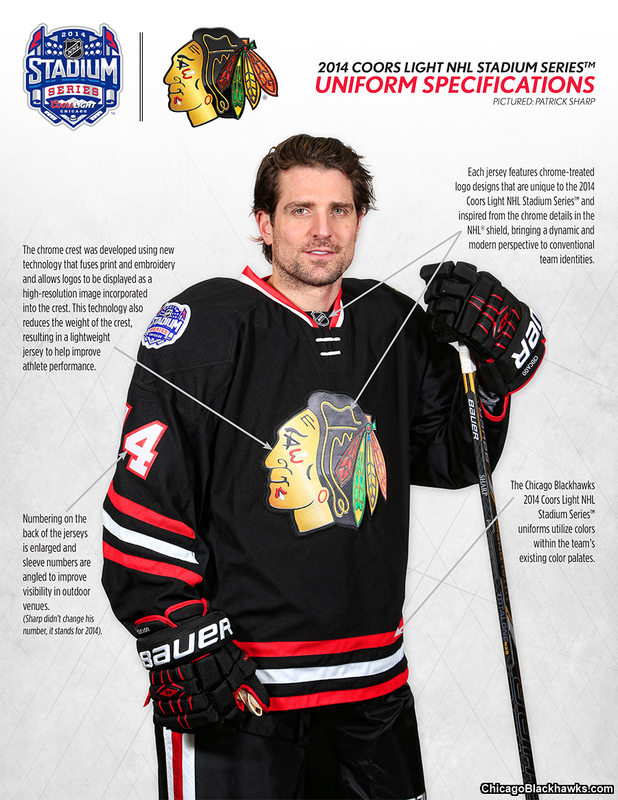 Likely the photo was taken by the Hawks and then Reebok supplied to propaganda to the team to place on the image. Either Reebok is infatuated with their own ideas and thinks that these notes really will appeal to customers or they think customers are dumb enough to buy this fluff. Likely it's a little bit of both. Starting with how they say the chrome logo is applied using new technology which reduces the weight of the jersey to benefit player performance. Even if it's new technology or the same crappy printing process they've been using on the shoulder patches of their replica sweaters since 2007, it looks cheap. New technology and better player performance? No one cares if it looks like a turd! Numbers on the sleeves have been angled for better visibility in outdoor stadiums. This one just seems like a square peg being jammed in the round hole. They angled the TV numbers just because it was something different and then they fabricated the reasoning behind it. The note on the top right of the image says that the chrome detailing was added "bringing a dynamic and modern perspective to conventional team identities". Want to know why teams didn't make their logos chrome in the first place? Because it looks stupid! If it was a good idea, several teams would have done it by now. Also, don't mess with team identities. Fans, for the most part, like the logo of their team and by adding some crappy effect to said logos many fans will distance themselves from it. Save the chrome for the Honda Civics! 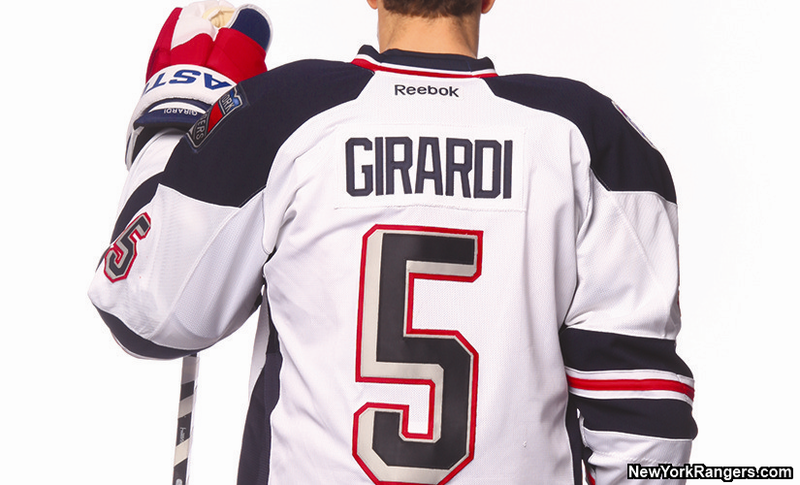 The final note seems to be an attempt by Reebok to reassure us. They've noted that they have used colours within the teams' identities. Oh good, because making the Hawks purple and orange for one outdoor game would make sense? Well, most of these other notes don't make much sense so I guess we should all consider ourselves lucky and thank Reebok.